Below are pre-made products to fit most standard size vertical or horizontal air compressors but can be used to fit most industrial machinery. Material is oil and chemical resistant and non-porous making them also moisture resistant as well. The acoustic sound curtains are impervious to dust, dirt, oils and most chemicals. Other noise barriers can be designed as custom depending on your needs, call for details. Wall hanging, track and roller, or free standing variations can be designed to suit. Other options available such as windows, sliding doors, or one or two panels. Panels can be portable and on casters or fixed and permanent. These acoustic sound curtains have 3 Year Warranty for parts and workmanship. 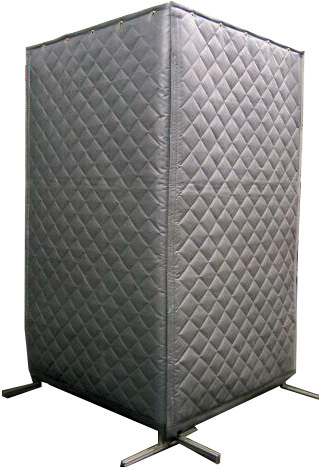 Portable acoustic sound curtains are an economical alternative to metal enclosures or walls. These screens are constructed of non-porous fiberglass cloth and can be steam cleaned. They are durable and tough with oil and chemical resistant materials. Sound barrier has a sound transmission loss of 47 db. Standard transmission coefficient is 27-29. Temperature range is between -20 and 180 degree Fahrenheit. All models are on casters for easy mobility. 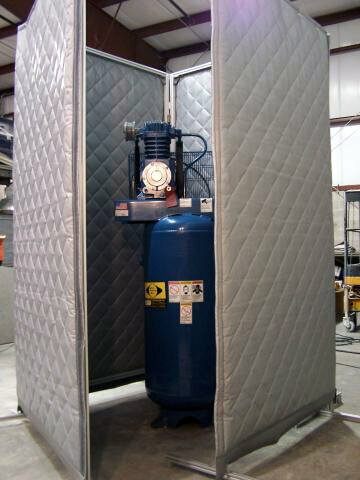 Specifically Designed for 5-10 HP Vertical & Horizontal Piston Drive Reciprocating Compressors 2, 3, & 4 Sided Screens! Note: There is a 7" gap from the bottom of the curtain to the floor on screens with casters. Vinyl wall curtains are great for confining contaminants for safer work environment. These industrial curtains are customizable depending on you application needs. These electric air compressors are used by businesses and homeowners. Direct drive electric air compressors are available in different configuration and sizes depending on your application. Powermate portable generators offers superior performance, reliability and durability that has powerful Honda, Kohler or Subaru gas engines. Great for boating, camping, tailgating, home backup and for everyday jobsite use.